Your search for JAMB Brochure ends here. JAMB official brochure for the 2019/2020 is available here. It’s accessible for free. The Joint Admissions & Matriculation Board, JAMB Brochure is now readily available online for candidates that wish to check their institution requirement, subject combinations and list of available courses online. Online JAMB Brochure is the easiest and convenient way to get relevant information regarding candidates’ institution of choice. JAMB brochure is freely accessible once you are connected to the internet. 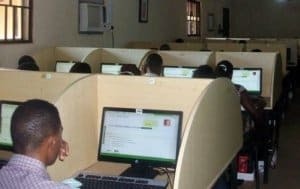 JAMB CBT Centres Approved for 2019 UTME Registration – Other States. Pls sir,i gave a wrong gmail account during registration, what can i do. I have all the subject but minus PHYSIC and C.R.S then what course can i apply with this subject i have sir?? Is entrepreneurship part of courses offered in UNN? pls sir wat is d best subjects to write in jamb under mass communication ?? Pls sir, i have this waec grades, maths b3, english c4, govt c4, civic education c4, marketing b2, agric b2, literature-cancelled, c.r.k d7, ecomics e8..what can i use it to study in university? Please I had my five credit, math,eng,government, civic, and CRS but I don’t see any course require for my credentials, please which course should I go for?? Please sir I want to study linguistics, what are the subjects I will sit for in jamb? Please I have national diploma in art and design and I want continue on my line at Abu Zaria and also Iam class room teacher now I need education in profession , what should I do? I’ve gotten admission in Bauchi Uni_A.T.B.U But it’s through Remedial but I don’t really like there coz it’s North. So someone told Me that If I write Jamb and Apply for another School and I made it in my Jamb that I will enter the Uni of my choice with 2Lvl is it true? Please Help me Thanks!!! Hello sir,In the jamb brochure The Delta State University was not listed .May I know why please?